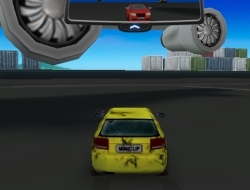 The mob is chasing you all around Vegas in this car driving game, starting even at the airport where you got off the plane. The most important thing is to not get caught, but keep in mind that your fuel is limited and you need to always keep an eye out for the power-ups. Try to outrun them and avoid collisions with them by constantly watching the rearview mirror. If you will damage the car you can also collect repair bonuses that will get you back on track in no time. Try to escape from them and outsmart them by doing jumps and getting style points for that, knowing that they might not be brave enough to do them. Use the arrow keys to drive and CTRL to use the handbrake. On The Run Vegas 2.00 between 0 and 10 based on 1 votes.